WASHINGTON, June 5 (Xinhuanet) -- Former US president Ronald Reagan died Saturday afternoon at the age of 93 at his home in California after suffering from Alzheimer's disease for a decade. His eldest son, Michael Reagan, issued a statement confirming his father's death. Reagan, whose health had deteriorated over the past few days, served as the 40th US president from 1981 to 1989. He was survived by his wife Nancy and three children. Two of the children had been reportedly at his bedside as news broke that Reagan's health was deteriorating. The movie-star-turned president, who suffered from the Alzheimer's disease, disclosed his disease in a letter to the nation in November 1994. He told the nation that he was suffering from the early stages of Alzheimer's disease, a degenerative brain disorder that leads to mental disorientation and physical decline. "I now begin the journey that will lead me into the sunset of my life. I know that for America there will always be a bright dawn ahead," he said in the letter. He has been out of the public eye ever since. 1932: Graduates from Eureka College, Eureka, Illinois. 1932-1937: Works as radio announcer at the US state of Iowa. 1937: Makes film debut with "Love is on the Air". In the following decades, he stars in about 50 Hollywood movies. 1966, 1970: Twice elected California governor. 1968, 1976: Makes unsuccessful bids for the Republican presidential nomination. Nov. 4, 1980: Elected president of the United States. March 30, 1981: Shot and wounded in an assassination attempt inWashington. Nov. 6, 1984: Re-elected US president. January 1989: Leaves the White House and returns to California after second term ends. Nov. 5, 1994: Discloses he had been diagnosed with the Alzheimer's disease. Oct. 11, 2001: Becomes the longest-lived US president ever. Ronald Reagan was a very successful President, in contrast with the cretin who sits in the White house today. Edited by joseph parikian, 05 June 2004 - 09:15 PM. Don't insult cretins please. Just jking. Disagree! He eliminated many programs, tripled the national dept!!!! !and took credit for the collapse of soviet union which was collapsing on its own failures anyway. Reagan had nothing to do with it other then that he was a good public speaker!. Reagan was great President. He knew that the Government is evil and does nothing to help people in social affairs. Unemployment was the lowest since WWII - if I'm not mistaken 3.8% . But probably the most valuable achievement of Reagan was the way he was dealing with the Soviet Union. Instead of isolating his administration due to the booming economy he stayed true to his conviction about the Soviets and yet introduced the policy of an "open palm". He wanted Russians to know what America is about. He wanted Soviets to trust him and to know that America is not about shopping and Holywood, but also a place where people can express themselves freely and a place where people enjoy their family life. With or without him the Soviet Union would have been able to cripple for another 300 years. The present misfortunate creature that occupies the White House that could not utter a sentence of decent English without the help of his aids can only dream about having the respect and dignity of Reagan. Joseph, you have a wierd choice of news sources I mean wasn't there a single US news report on their president's death? I actually kind of admire that. We lost a fine man who was worthy of respect. Too bad that it was glossed over because of D-Day. Unlike daddy's boy in the White House he was someone who had surpassed himself. Edited by joseph parikian, 08 June 2004 - 05:32 PM. look at me...i can fly!...sploosh! and another note- i dont think reagan like bush knew much about politics- hes like a puppet- following orders-- politics- he was an actor before and somehow got into politics and got elected somehow-- but those are only opinions i hold-- i think when people die the become "sweeter" as we armenians say-- they always speak of the good not the bad- which is respectable. Edited by angel4hope, 08 June 2004 - 05:34 PM. 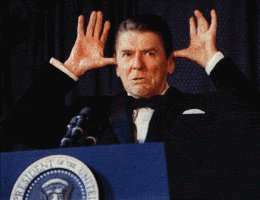 In my modest opinion, Raegan was one of the numerous "clowns" on capital hill, but I believe that he should be noted as a significant president in terms of ending the tensions of the cold war, and easing the Soviet Union in to realizing that their government would not work. He applied his previous career as a screen actor to his presidential duties in office, using the "SDI"- the Star Wars thing to get the Soviet Union to collapse...he saw it was working and that the Americans liked him, so he continued, fluctuating as often as the polls. His death is a tragedy, because his last public picture, taken when he was 89, captured him barely able to recognize his own wife...he combated for more than a decade against the inevitable Alzheimers desease, and finally lost and succumbed to death. Although mostly in the world we have so far seen sympathy and respect at Raegan's death, the middle eastern leaders have been accusing Raegan for supporting Israel, and for being antagonistic to them. One Libyan leader even claimed that he should be held responsible for these actions, brought to trial- a man dying from Alzheimer's desease who couldn barely recognize his wife's hand- for having killed about 32 Libyans in retaliation for a terrorist attack commited against him. So soon after his death, leaders are already protesting and lacking respect, if not eulogizing Raegan. Edited by invizionpolitik, 08 June 2004 - 09:20 PM. WASHINGTON (June 8) -- Ronald Reagan's enthusiastic supporters say the late president deserves a place on the nation's currency, even if it means a lesser or disappearing role for Franklin D. Roosevelt, Alexander Hamilton or Andrew Jackson. Getting their hero's face on the dime may be easier than other goals, such as seeing it etched on Mount Rushmore, but that idea still will be resisted by Democrats defending their own icon, FDR. Rep. Dana Rohrabacher, R-Calif., a speechwriter in the Reagan White House, plans to introduce a bill to put Reagan on the $20 bill, replacing another venerable Democrat, Andrew Jackson. That would join a previous proposal, by Rep. Mark Souder, R-Ind., to provide for dimes bearing the likeness of Reagan. The office of Sen. Mitch McConnell, R-Ky., said he would pursue an idea he has pushed for several years, placing Reagan on the $10 bill now bearing the visage of Hamilton, the first Treasury secretary. Chris Butler of the Ronald Reagan Legacy Project, which has the goal of seeing a Reagan commemoration in every American county, said its top legislative priority is the $10 bill. He noted that money can be changed administratively without congressional action, and suggested that Reagan dimes could join, rather than replace, FDR dimes. The Treasury secretary can change the design of coins, usually after consulting Congress, but spokeswoman Anne Womack Kolton said, "We believe it is premature at this point to discuss any possible changes to the currency." Replacing FDR would not happen without a battle. Last November, on the same day Souder introduced his Reagan dime bill "in honor of his work in restoring American greatness and bringing freedom to captive nations around the world," Rep. Jim McGovern, D-Mass., proposed a resolution affirming support of the FDR dime. More than half the House Democrats joined him as co-sponsors. Reagan's wife Nancy has also voiced opposition to the new dime. Souder last December praised the "humble nature" of Mrs. Reagan's comments but said he would continue to promote his bill, which has the support of GOP leaders, including House Speaker Dennis Hastert and Majority Leader Tom DeLay. Butler, whose group is a wing of the conservative Americans for Tax Reform, pointed out that coins bearing the likeness of FDR, John F. Kennedy and Lincoln all appeared within a year of their deaths. The Roosevelt dime came out in 1946, in part commemorating his support for the March of Dimes campaign to fight polio. Besides paper and metal, Reagan advocates have long pushed to see their champion honored more widely in stone. Butler said there are now some 54 highways, schools, post offices and other memorials to Reagan around the country, but that still pales in comparison with the more than 600 for Kennedy and more than 800 for Martin Luther King. Up to now, the biggest victories have been the renaming of Washington's National Airport after the 40th president and the opening in Washington of the Ronald Reagan Building, the second largest government office building after the Pentagon. Last year the nuclear aircraft carrier USS Ronald Reagan was commissioned. Still in the works is the idea of a monument to Reagan on the National Mall in Washington, deterred by a law - signed by Reagan - that bars new monuments until a person has been dead 25 years. Then there is Mount Rushmore. It will take a long time to study the geophysical and artistic feasibility of that project, Butler said. But "is he great enough to be on Mount Rushmore? Yes." Like I said before, after all these years, Reagan finally made his death official. It's about time this old fart croaked. I loathed him. He was just another imperialist war monger that pretty much ruined peoples abroad and the country here. Good riddance! Now, for some memorable moments. Joseph, that was my kind of appreciation . Anyway. Reagan was not China's enemy. Although there were strong disagreement between the U.S. and China on the Taiwan issue, they secretely moved together against the Soviet occupation of Afganistan. China supplied Afgani mojahedin with weapons, especially with analogues of Soviet AK-47. He applied his previous career as a screen actor to his presidential duties in office, using the "SDI"- the Star Wars thing to get the Soviet Union to collapse..
Russians knew that SDI is an American hoax. They knew that Reagan is using SDI as a tool to make them sign the deal about all strategic nuclear missiles. By the time even when Americans developed SDI, Russians came up with equally futuristic and virtually impossible Space military program which was intended eventually to neutralize SDI. This time Americans knew about it, so they were 50/50. The agreement stipulated that Americans will keep up with their SDI and in the same time both sides agreed to get rid of all strategic nuclear arsenal. For Russians that meant intercontinental ballistic missiles where they were prevailing and for Americans that meant air and submarine missiles where they had the upper hand. The reason why Russians agreed to SDI was exactly because they knew that it is a hoax. The Russian response to SDI was placing small metal particles (made of a very interesting metal as a structure ) in the outer space which would have been able to block the SDI umbrella. A typical Russian response. Cheap and effective, while SDI would have cost billions and billions of $$$. Americans were not stupid either, but they needed a face saving situation for the public. Russians never bothered with the face saving, because most of them were faceless communist animals.